So many new restaurants these days are what you’d call elevated bars. You know, the ones mostly designed for drinking, but run by pedigreed chefs who cook food that’s smarter than the usual chicken wings and bar burgers. 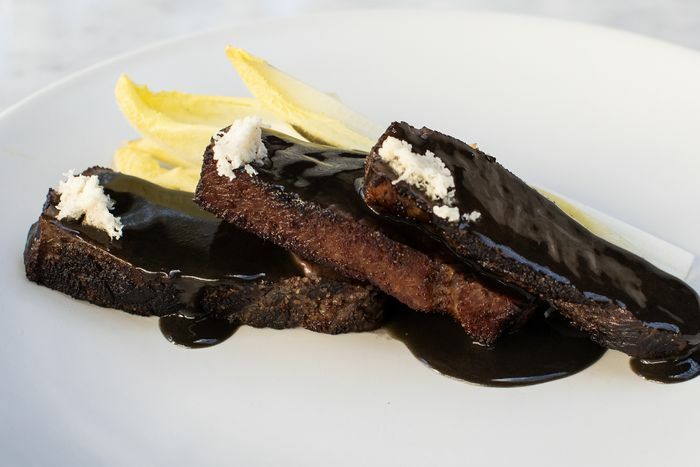 Then there are those small, overachieving restaurants that strip down fine dining, keep the fine-tuned food, and make it all feel a bit more democratic: think Faun, the Finch, and the raved-about Olmsted. 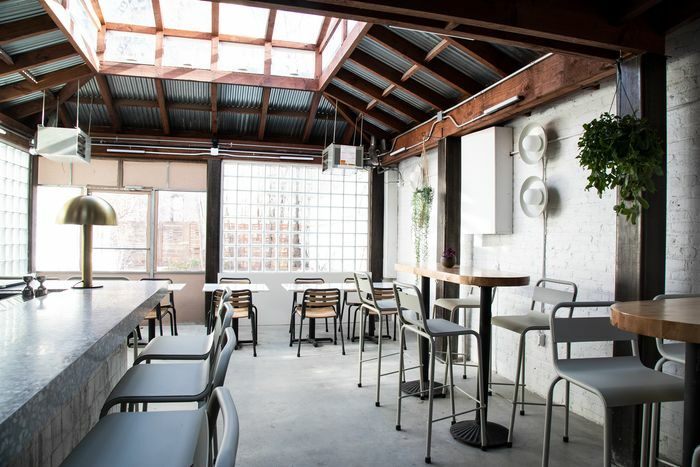 Add Oxalis to that list, too, as the now former pop-up bistro has settled into a home of its own in Prospect Heights. 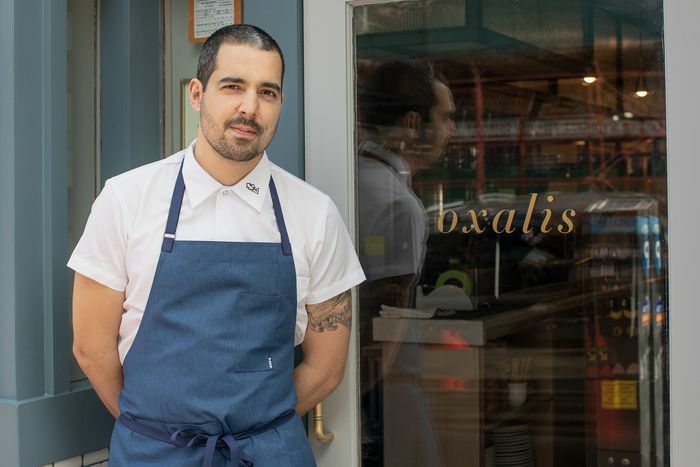 “It’s nice just have a place we can finally set down roots and build the space we’ve been trying to create for the last couple years,” says Oxalis chef-partner Nico Russell. 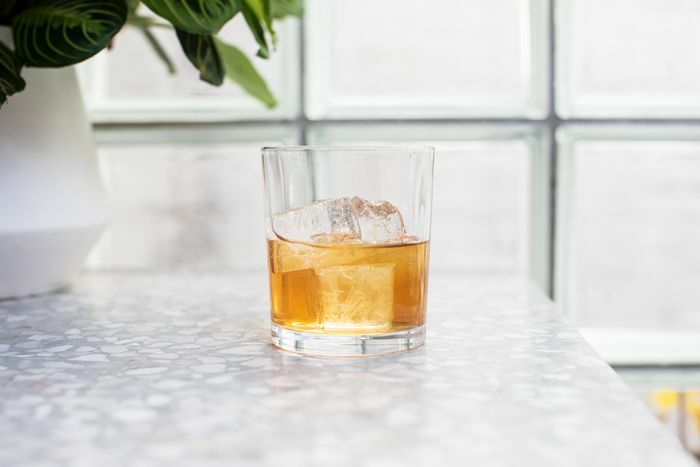 It’s a brand-new restaurant, but also one that’s been a work in progress by Russell and partners Steven Wong and beverage director Piper Kristensen, who made drinks at the much-missed, boundary-pushing Booker & Dax as well as the Bearded Lady. Over the course of a couple years, Oxalis popped up over 30 times around New York. Dinners sold out, and Russell’s precise, ambitious cooking clearly hit the right note with dishes like sasso chicken with rainbow chard and a caramelized mousse whey. 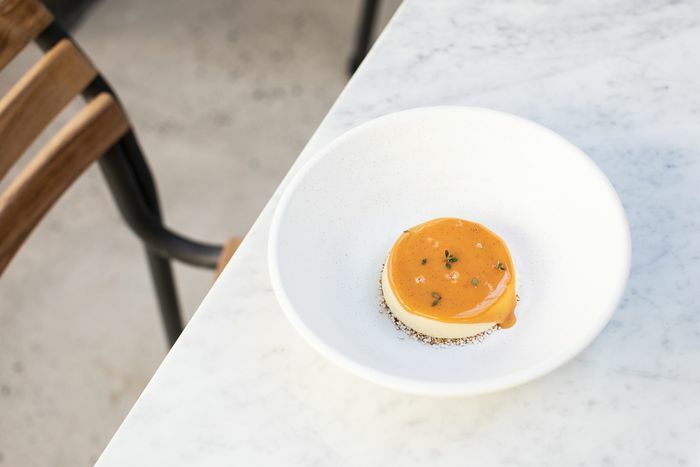 To see another middle-tier but ambitious restaurant open is an exciting thing, too, when it can feel like almost everything opening these days is either a hyperexpensive, high-end tasting-menu spot or a fast-casual venture tailored for replication. “New York is a great city for a few different things, there’s a ton of high-end and a ton of low-end. It’s hard because what defines the middle?” Russell asks. 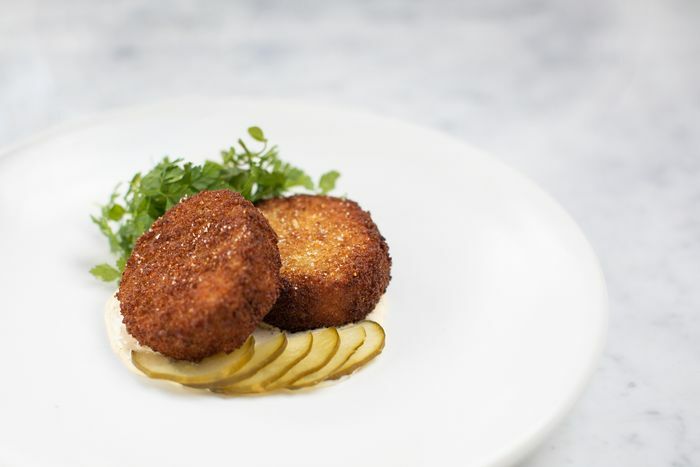 Before striking out on his own, Russell worked at one of New York’s most serious restaurants, Daniel, as well as at France’s lauded Mirazur. (“Everything is sort of free-form,” he says of the latter.) Those are both destination restaurants where deep pockets are very welcome; for whatever it’s worth, Mirazur was third on this year’s controversial World’s 50 Best Restaurants list. 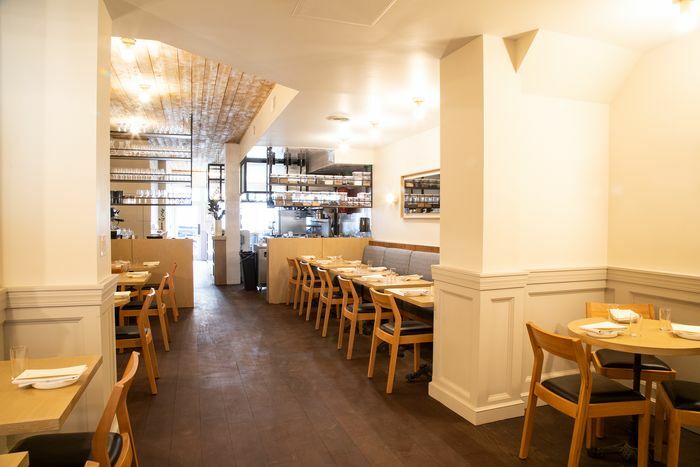 The restaurant is split into two spaces: a smooth, steely-looking barroom with cool blue tones and a big ceiling window, where you can order à la carte, and a 32-seat dining area with a set four-to-six-course menu. 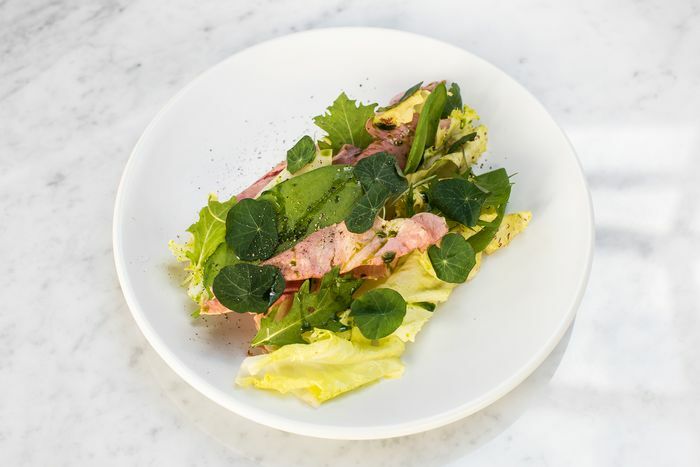 The bar menu has a couple handfuls of savory and sweet dishes that creatively cover categories you’d expect: house-made brioche, cheddar toast with charred winter greens, and meaty options like crispy pig trotter with mustard, and beef shoulder with endive. The food is, Russell says, 80 percent vegetables. 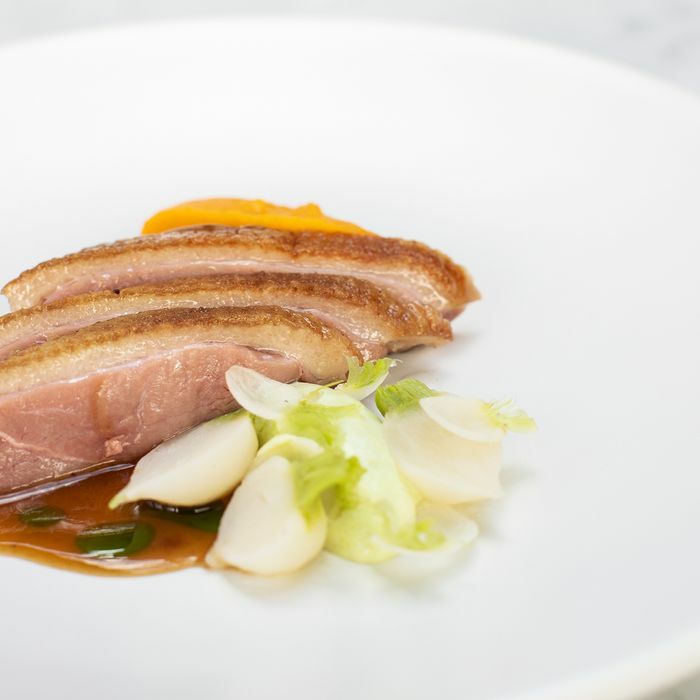 Other dining room dishes include young carrots with chamomile; squash with burrata and flaxseed; and duck with sweet potato, fig, and yogurt. Kristensen’s abbreviated cocktail menu sticks to classics new and old with slight, undisruptive tweaks. Think an Old Fashioned made with beeswax and lanolin, a Sgroppino with bitter-lemon sorbet, and a Daiquiri that, to enhance the lime juice’s citrus, is also made with lime oil.